Focusing on elegance, autographs and memorabilia, 2014 Topps Supreme Football returns with the promise of one hit per single-pack box. For those looking to chase big-time patches and low-numbered cards, it's similar to a dice roll. Sticking with a similar formula of past years, each box is led by a low-numbered autograph or memorabilia card. They come in several combinations of veterans, rookies and retired stars. Autographed Rookie Cards spotlight key members of the 2014 first-year class. Numbered parallels include Blue, Violet, Green, Printing Plates and Red (1/1). 2014 Topps Supreme Football has a pair of autographed book cards that are inserted as box loaders. Autographed QB Playbook cards have a quarterback's autograph along with a hand-drawn diagram of their go-to play. Nickname Autograph Book Cards are done with a black design and signed in silver ink. Besides a traditional signature, they're inscribed with the player's nickname. Autographed Retired and Veteran Stars Autographs bring some non-rookie signatures to the product. More than 30 standouts are signing for the set. Parallels come in Blue, Violet, Printing Plates and Red (1/1). Multi-player autographs come with as many as eight signatures. Six Autograph inserts are double-sided while rare Eight Autograph cards are done with a book card style. None of the autographed relics come with basic single-swatch jerseys. Autographed Patch, Autographed Quad Relics and Autographed Jumbo Patch cards feature multiple generations of players. They also have multiple levels of parallels numbered to 25 or less. Autographed Team Logo Patch Book Cards (1/1) come with a massive logo on one side of the card and an autograph on the other. Rookie Dual Autograph Die-Cut Relic Book Cards (#/5) and Dual Autograph Patch Book Cards (#/15) combine signatures and memorabilia from multiple players. 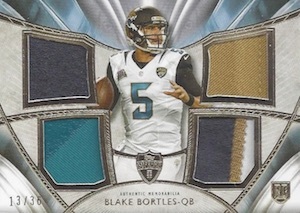 Rookie Quad Patch Cards and Rookie Quad Combo Patch Cards each have four swatches. 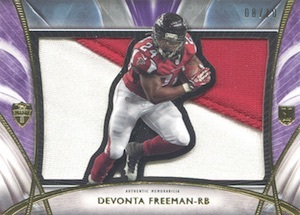 The come with Blue (#/15), Violet (#/5) and Red (1/1) parallels. Rookie Die-Cut Relic Cards are highlighted by a massive player-worn swatch paired with a die-cut image. 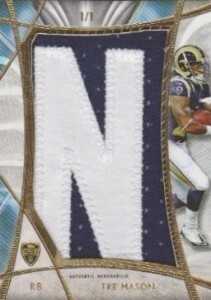 In additional to regular numbered versions, there are Violet Patch (#/25) and Red Patch (1/1) parallels. 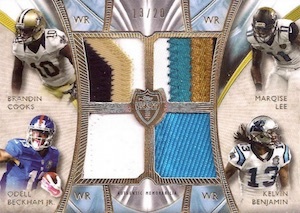 Veteran Quad Relic Cards come with three jersey swatches and a patch. The product has several levels of ultra-premium one-of-one relic cards. Among them are Jumbo Supreme Patch Cards, Jumbo Supreme Glove Relics, Letter Patch Cards, Supreme Shields and Supreme Tags. While it may not be the focal point for all collectors, 2014 Topps Supreme Football does have a base set. Like other elements in the set, it mixes current stars, rookies and retired players. Parallels include Blue, Violet (#/150), Sepia (#/99), Green (#/50), Printing Plates and Red (1/1). 2014 Topps Supreme Football is packaged in 16-box cases. The hits in each break down to four autographed relics, three autographed rookie cards, two additional autographs, a multi-signature card and five relic cards. The final hit comes from any of the levels except basic relics. 100 cards. Serial numbered #/162. 40 cards. Serial numbered #/36. 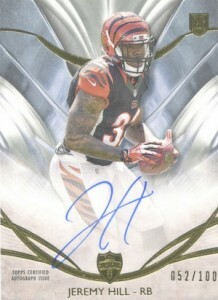 Good: Every card is numbered, quality card design, on-card rookie autographs, solid veteran content, big hit potential. Bad: Expensive for three base cards and one hit, guaranteed hit could be autograph or relic card, classic gamble product. 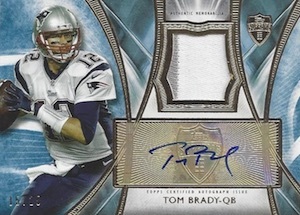 The Bottom Line: 2014 Topps Supreme Football improves on a few things, notably on-card signatures for the rookies, but is still a very dicey proposition to break on a box-by-box basis. The fact that the guaranteed box hit can be an event-worn rookie relic makes it a huge gamble. While the overall design has not changed much, the usual quality of the Supreme cards makes this a good thing. The base cards, which occupy three-fourths of the box, feature a little more color and intricacy in the background design compared to 2013. Although all the base cards are numbered, the total numbers, like 162 for the base set or 144 for the Blue parallel, seem a little odd. Supreme has long been associated with sticker autographs so it is nice to see that the main rookie autograph set now features on-card signatures. This certainly helps the value in both the short- and long-term. Unfortunately, hard-signed cards were not extended to the veteran signers. Also, the autograph relics and some of the biggest hits, like the many booklet cards, still include sticker autographs. Quad Relics are the most likely memorabilia card hits and are tough to get excited about. 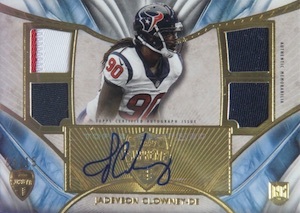 Whether a card has one single-color jersey piece or four, if this is to be the only hit in a box, it would be nice if the card had something more to make it unique. Overall, the checklist is strong. Rookie names like Odell Beckham Jr., Teddy Bridgewater and Derek Carr are joined by vets and HOF players like Tom Brady, Dan Marino and Emmitt Smith in the autograph department. Sure there are still some weaker options, especially for the rookies, but 2014 Topps Supreme Football does a good job of tightening up the list of first-year signers. Although the lower print runs are inflated by the various parallels, the main rookie autographs are generally limited to 100 or less, helping the rarity and value. There is a ton of potential value in 2014 Topps Supreme Football, but you will face a tough task trying to find that value in a box or two. Three base cards and one hit is as risky as it comes, especially given the $70-80 box price. Value can take an even bigger hit if you are pulling relics instead of autographs. 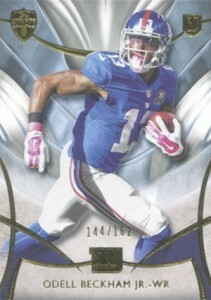 Short and simple, Topps Supreme offers quality and a chance at something big. However, when three of the four cards are base, it seems like filler more than anything. The move to on-card autographs for the rookies was the right call and it would be nice if that would be applied to the veteran players as well. Obviously the collecting aspects differ, but Topps Supreme Football might be better off following the format of its baseball counterpart. 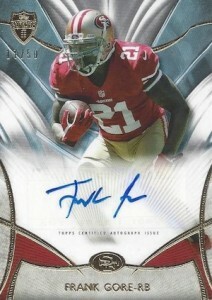 Most don't collect Supreme for the base cards and the two guaranteed autographs would be a much better selling point. Really, even one guaranteed autograph would be better overall for collectors considering the high-end designation, format and pricing of the product. Supreme is like a fine wine, it gets better with age. This years Supreme doesn’t let you down, lots of big name players and no “Fillers”. I’ve pulled a ” Bortals #10 and a Odell Beckham Jr. Green rookie auto. Also a Colin Kaepernick 1/1 Supreme Laundry Tags Relic that’s autographed. I haven’t seen many of those. I opened one box. I’m used to buying cheaper card boxes and packs. Pulled a Carr RC Auto Violet /25 so the buy paid off. Got it graded. POP1 at that. 2014 Topps Supreme Factory Sealed Football Hobby Box Jimmy Garoppolo AUTO ? ?